Former al-Shabab leader Mukhtar Robow attends a news conference in Baidoa, Somalia, Nov. 4, 2018. Last year Mukhtar Robow had a $5 million U.S. bounty on his head. 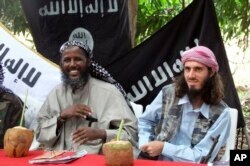 Now the former Islamist al-Shabab militant has downed his guns and donned the garb of a democrat. While Robow is not the first ex-militant to enter Somali politics, the momentum behind his bid to become a regional leader has turned his effort into a watershed moment in the stand-off between the federal government and Somalia’s seven semi-autonomous regions. How Mogadishu and those states ultimately find ways to share power — including via elections such as the Dec. 5 vote in the South West state where Robow is running — is critical. "It’s a pivotal point in the confrontation between the government and federal member states, which is probably a much greater threat to Somalia” security than al-Shabab itself,” said Matt Bryden, head of the Nairobi-based think tank Sahan Research. FILE - A general view shows the scene of an explosion in Mogadishu, Somalia, Nov. 9, 2018. Al-Shabab has been fighting for more than a decade to topple the weak central government and implement strict Islamic law, often sending suicide bombers against civilian targets. He laid low with his militia for several years before renouncing violence and recognizing the authority of the federal government in August 2017. He is now running as an independent. During this time the U.S. withdrew a $5 million reward for information leading to his capture and removed him from their list of sponsors of terrorism, although other international sanctions remain on him. The former insurgent, who once spent time training with the Taliban, has cast himself in a civilian role, donning dark suits and a clerical cap. After the Shabab bombing that killed around 500 people last year, Robow was photographed donating blood. On Sunday, the state electoral commission announced it had accepted his candidature, dismissing federal demands that he be barred because of remaining U.S. Treasury Department sanctions. Other states like Jubbaland and Puntland, who have their own polls slated for the coming months, are watching closely whether the government tries again to block Robow’s candidacy. "If they [the government] try to force the candidate that people want out, they can also do that in other areas. 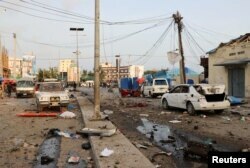 Then there will be no peace," a senior Somali regional official told Reuters. Robow's allies and some analysts suggest central government is less concerned with his past and more worried his popularity with the Rahanweyn clan — one of Somalia’s most powerful — will propel him to victory ahead of their chosen candidate. "All the intellectuals, youth and traders of South West state, have... decided Sheikh Mukhtar Robow will be our candidate," Hassan Haji, who had himself been a candidate, said just after the commission's announcement. Robow is campaigning on a security card, promising in an October rally: "If I win, I will eliminate the al-Shabab militants, bandits in government uniforms and other clan militias who disturb our South West state." FILE - Mukhtar Robow, then a leader of the Somali militant group al-Shabab, is seen at a news conference at a farm in southern Mogadishu's Afgoye district in Somalia, May 11, 2011. For many Somalis, Robow’s rehabilitation as a politician would be a step too far. Much of the online debate about him refers to the attacks he helped coordinate with al-Shabab. Yet despite their misgivings and those of the central government, Robow could also become a potential thorn in al-Shabab's side, some analysts believe. "It's about people seeing the potential of democracy," he said. "If there's no reward for coming over, it just encourages a fight to the death."